Window bird feeders are a great way to watch birds from inside your home or office. If you live in the city apartment building or work in your office on the higher floors it can be difficult to hang regular feeders. Even if you live in a regular home and just want a better view of your backyard visitors, window bird feeders are a great choice. But picking a right window bird feeder can save a birdwatcher lot of frustration. What you want is one quality, safe, and durable product that will stick to the glass and not fall off and brake. Well I got some good news for you, Birds-I-View bird feeder by Nature Anywhere is just what you might need. 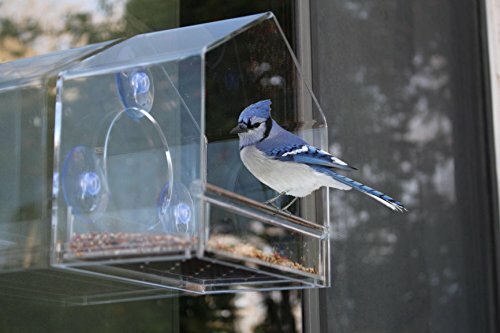 This window bird feeder is sold at Amazon, and what is the most interesting fact is that this bird feeder is one of the best sellers and with 100% MONEY BACK GUARANTEE. That got my attention and I decided to review this interesting feeder. 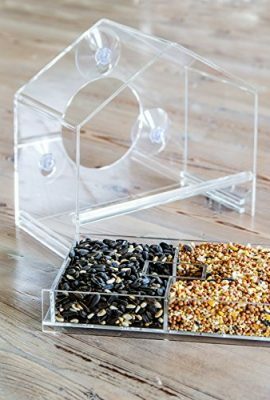 This window bird feeder is made of acrylic material that is 4mm thick but feels light. It sticks to the window with 3 suction cups like you expect from a window feeder. The suction cups look durable and easily hold the feeder when full. When pulled the feeder did not move and stayed firm. I recommend that you wash the window first so that the surface is clear from dust or other stuff that can prevent contact. The feeder is robust and even if you drop it from a normal eye level height it will survive the impact. This is important as some other window bird feeders can brake if they fall when full of seed. The one feature I really like is the sliding feeding tray. There are two separate compartments made to hold two types of seed. This is great for bird lovers who want to attract different bird species at once. The tray slides out when you want to fill it with seed and then slides back in. No brainer there, even my old mother can do it with ease. You can just take the feeding tray off when you want to refill it, and leave the feeder on the window. This way you never have to take the feeder down. The tray is made to hold up to 3 birds, and even if some bird species come in flock, like the American goldfinches, they can still get to the food. This will prevent fights, but birds will be birds, some can still try to push their way in, just let them be. The seed capacity is bigger than most window feeder and you will refill less often. But like all window bird feeders there will be empty hulls under it. You can use no mess bird seed to bring this to the minimum. Good to attract cardinals and finches. This Birds-I-View bird feeder can be installed on any normal window or glass surface. I recommend that you look for the possible predators when you do that. If you have a cat, make sure you install it in a way so the birds can see the cat coming. Place it so there are no plants or other view obstacles where cats can sneak up on them. Squirrels are one more thing to have in mind. If you have squirrels place the feeder little higher from the ground, and away from objects they can use to jump on the feeder. Don’t place it so the birds can see another window in the opposite wall of the house, they can mistake it as a fly-through zone. As long there is a dark background birds will be fine. What Birds Can You Attract? Cardinals, titmice, nuthatches, grosbeaks, chickadees, finches etc. You will attract lots of birds with sunflower seed , it’s a favorite seed of lots of wild birds. This feeder is luckily designed with drainage holes at the bottom of the tray. So if you get some rain the water will flow out. The seed will still be wet so don’t forget to change it. But this is a welcome feature and so many other products don’t have it. What I like with the Birds I View is that it is so easy to clean. You can wash it by hand with some soap and you are done. There are no metal parts to rust or get damaged by water like on normal feeders. The feeder can be cleaned once a month or even less, the feeding tray is what you will empty the most, and it is easily removed. 3. Can be used by children or elderly. 4. Gives you a beautiful view of the birds from your home. 5. Easy to clean, no metal parts that can rust. 6. Bigger size than normal window feeders. 7. Can hold two seed types. 1. Less capacity then regular metal tube feeders. 2. Squirrels can access the feeder if placed low. 3. It takes 3 birds at a time, some tube feeders can take up to 9 birds. Birds I View is well made, durable, strong window bird feeder. It is weather resistant and can be cleaned easily. The feeding tray is designed to be used by children and adults with ease. Once you install it you don’t have to take it down for refilling. Capacity is bigger than other window feeders, but still less than larger tube feeders. Birds will leave empty hulls at the bottom of the Birds-I-View bird feeder so you will have to clean, but the view of your backyard visitors will make you forget about that. Comes with 100% MONEY BACK GUARANTEE, and the price is just about right, you get great value for your money. Watch the company official video!